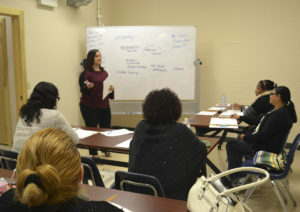 UNC is conducting an innovative new class to help English language learners enter the health care field, one of Lackawanna County’s high priority occupations. This four week course helps participants gain a working knowledge of the duties and skills required for a home health aide position. Students will also work with UNC case managers on resume writing, interview skills, job searches, and other individual tasks to meet career goals. For more information on ESL classes, contact UNC at 570-346-6203.